Don't worry, the Spring Awakenings' show is still running - it doesn't end until June 12, 2007. All of the pieces from the upcoming Spring Awakenings show are now available online. 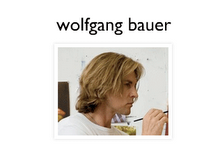 A series of large, rich, and loaded oil paintings by Wolfgang Bauer. For the first time in Los Angeles, the Austrian-born artist presents his androgynous, bold and curious work in its entirety. Wolfgang Bauer states that his aim is to provoke thought to find acceptance for “the Other” who is different than the accepted “normal” individual.